Martin Puchner is the Byron and Anita Wien Professor of Drama and of English and Comparative Literature at Harvard University, where he recently founded a new program in theater, dance, and media. His books and anthologies range from philosophy to the arts, including The Drama of Ideas: Platonic Provocations in Theater and Philosophy (Oxford, 2010; winner of the Joe A. Callaway Award), Poetry of the Revolution: Marx, Manifestos, and the Avant-Gardes (Princeton, 2006; winner of the MLA's James Russell Lowell Award) and Stage Fright: Modernism, Anti-Theatricality, and Drama (Hopkins, 2002; 2011). He is a member of the European Academy and has received numerous awards, including a Guggenheim Fellowship. His best-selling Norton Anthology of World Literature and his HarvardX MOOC have brought 4000 years of literature to students across the globe. 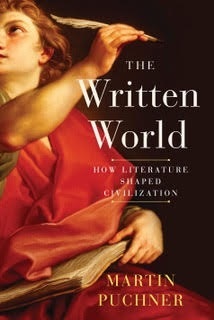 His forthcoming book, The Written World, tells the story of literature from the invention of writing to the Internet. He is currently at work on a book about Rotwelsch, a secret language based on Yiddish, Hebrew, and German that has haunted his family for three generations. It is called The Rotwelsch Inheritance: Biography of a Secret Language. Finding stories in the chaos of history. Willingness to make a fool of myself. To understand how stories shape history. Teaching 4000 years of literature to students from 160 countries through my MOOC Masterpieces of World Literature. Deciding what to include—and exclude—in the market-leading Norton Anthology of World Literature. My beloved partner, Amanda. Umberto Eco, for his intellectual detective stories. Lu Xun Park in Shanghai; the old Renaissance library at the University of Bologna; my study. Understanding Rotwelsch, a secret thieves’ language spoken in Central Europe from the Middle Ages to the 20th century, that has haunted my family for three generations.